One need do no more than listen to this excellent 16-voice chorus for a few minutes to accurately surmise that its director, Jamie Hitel, hails from England. What he has built at Christ Church, Greenwich, Connecticut since assuming the directorship in 2008 is of a quality and style that would suit any cathedral in England. Not surprisingly, then, this is a program of very Anglican music for the season of Lent and the Festival of Easter, performed as one might hear it sung during worship services. Plainsong is included, and shows the unanimity and flexibility of the choir’s phrasing and the accuracy of its intonation unaccompanied. Not all of the music is British, but even the familiar pieces by Belgian César Franck and Italian Giovanni Battista Pergolesi—only the opening duet from the sequence—have the air of the English service about them, which is all to the good as far as these ears are concerned. These works, and others such as the Bach, Handel, Purcell, and Charles Villiers Stanford, are written for solo voice or voices and are simply sung by the whole choir or sections. John Ireland’s famous anthem was written for treble choir, with an occasional well-taken solo, as are more modern works by Colin Mawby, Peter Hurford, Malcolm Archer, Thomas Foster, and Claude Means. Only rarely do the girls sing in more than two parts, though this is part of the beautiful simplicity of the program. One exception is the strikingly beautiful ending to visiting artist Philip Moore’s setting of John Wyeth’s Come, Thou Fount of Every Blessing. The anthem by Thomas Foster and the Bach aria are accompanied by obbligato flute; the playing of Victoria Hoffmeister in the Foster is particularly nice. The St. Cecilia Choir of Girls, sweet-voiced and polished, has made significant strides since a pleasant but less accomplished live recording in 2010, available on the church’s web site. It was made just two years after Hitel’s arrival, following a scandal created by the previous music director. Clearly the long-admired music program of this historic parish has survived and thrived under the current director’s care and tutelage. The sound, described as a Candlewood Digital “Natural Presence” recording, lives up to its name, offering just enough space within the natural bloom of the church to create an attractive blend to the voices without losing detail or presence. The organ, usually discreetly in the background, has real bite and solid bass when called for. One small gripe: The text on the back is too small and low in contrast for reading in all but the brightest light. Otherwise, an exemplary, and most charming, release. To many the St. Cecilia Choir of Girls, Christ Church, Greenwich, Connecticut, will be unknown. Perhaps the repertoire, on a new disc from MSR Classics, of Music from Lent to Easter will not necessarily attract much attention. This would be an enormous shame as this choir is of such a standard that they are a match for many English collegiate choirs. The repertoire on this new disc is very well chosen ranging from plainchant and Pergolesi through to Stanford, Peter Hurford and Philip Moore. The St. Cecilia Choir of Girls under their Director of Music, Jamie Hitel, serves as the principal choir for the 9.15am service at Christ Church each Sunday. The choir consists of girls from 3rd grade through high school seniors. The St. Cecilia Choir of Girls visited England for twelve days in July 2010, singing services in Exeter Cathedral and St. George’s Chapel, Windsor Castle. Girl and boy choristers combined for a highly successful tour of England in the summer of 2012, where they spent a week singing services at York Minster and Coventry Cathedral. Their new CD entitled A Thing most Wonderful is divided into two halves, Lent and Passiontide and Easter. The music for Lent and Passiontide opens with John Ireland’s Ex ore innocentium opened by soloist Gabriella Hitel, who displays a lovely pure voiced sound, catching something of the timbre of a boy treble, especially the upper notes. As the choir enters, they too have an especially fine tone, very Anglican in sound in this lovely performance. In César Franck’s Panis Angelicus it is lovely the way Jamie Hitel draws subtle little dynamics and textures from the choir – exquisitely done. Plainsong can leave voices terribly exposed but with the Plainsong Lent Prose this choir have a consistently accurate and appealing quality. By the Waters of Babylon by Colin Mawby (b.1936) is a very fine work, slowly building from a gentle opening and rising, midway, full of passion. There is some particularly fine singing as the music falls to the gentle coda. Peter Hurford (b.1930) will be known to most people as one of the finest organists of his generation. Here his Litany to the Holy Spirit brings an attractive directness of utterance and a timeless quality to the writing. This fine choir brings some lovely touches. Soloist, Victoria Hoffmeister opens the Plainsong Pange Lingua responded to by the choir with the Christ Church acoustic adding much to the attraction of this performance, so finely judged. Next the St. Cecilia Choir of Girls sings the first section of Giovanni Pergolesi’s Stabat Mater. Organist, Alistair Reid provides some lovely playing as he sets the rhythm and pace before the choir flows forward in a confident, beautifully layered performance with Reid adding further lovely touches. Charles Villiers Stanford’s A Song of Hope proves to be a powerful piece, with a full organ contribution and some glorious vocal passages with well controlled dynamics from the choir. Soloist, Madeline Wolf, opens Malcolm Archer’s (b.1952) My song is love unknown. She has a lovely voice with some fine lower textures. When the choir joins they bring out all the varying textures of this fine setting with a lovely conclusion. The music for Easter begins with the Plainsong Victimae Paschali with lovely contributions from the two soloists, Katherine Meurer and Madeleine Hitel. Handel is represented here by his If God be for us, a fine choice from Messiah in which both organist and choir bring a suitably Handelian flavour, with some lovely long held notes and phrases and some finely done intricate passages. Thomas Foster’s (b. 1938) Lift your voice, rejoicing, Mary opens with Victoria Hoffmeister (flute) accompanied by the organ, before the choir gently leads on in this rather fine piece, where the flute makes a natural and fitting addition to the texture with its pastoral in feel. There is an exceptionally fine performance of Purcell’s Sound the trumpet with long held notes and some lovely overlaying of voices. Christ Church’s Visiting Artist, Philip Moore (b.1943) provides a particularly individual and attractive setting Come, thou fount of every blessing with a beautiful melody, very finely sung by this choir and developing in texture in the final verse. This is a very fine work indeed. Richard Wyton (flute) adds a fine texture to J. S. Bach’s Ich folge dir gleichfalls bringing a delicacy that combines well with these lovely transparent voices. Claude Means (1912-1999) was Organist and Choirmaster at Christ Church, Greenwich from 1934 to 1972) His gentle Savior, like a shepherd, lead us receives a perfectly paced and moulded performance. It is a lovely little work. The music of Philip Moore returns to conclude this disc with his Jubilate Deo. After a brief organ opening this choir bring a joy and lightness in a very fine performance of this brilliantly written piece; so uplifting. This fine choir deserves to be heard, especially in the fine choice of works on this disc. They receive sensitive support from organist Alistair Reid and are finely recorded in the sympathetic acoustic of Christ Church, Greenwich, Connecticut. There are notes on the music set alongside composer information and full texts and English translations. There are biographical notes on Director of Music, Jamie Hitel, organist Alistair Reid and Visiting Artist, Philip Moore. The individual choir members are credited, but I would have liked more information about this fine choir. The St. Cecilia Choir of Girls was founded at St.Paul’s Episcopal Church in Akron in 1952. A select group of 15 girls between ages seven and 18 was chosen from the 32-voice ensemble for this recording. They present a lovely mix of carols and anthems spanning the liturgical season from Advent through Candlemas. Traditional carols alternate with mostly familiar anthems and settings of the season by Boris Ord, Matthew Martin, Andrew Carter, Edward Bairstow, John Rutter, G.R. Woodward, Charles Wood, Benjamin Britten, Charles Callahan, and Geoffrey Burgon. Performing in unison and two-part textures, the girls produce a warm, pure, energized, and mature tone. Unison singing can be treacherous, but this well-trained ensemble shines with fine blend, intonation, balance, and dynamic shading. The 15 voices are capable of holding their own against the occasional full organ, as well as producing lovely dulcet tones. There is some excellent solo work along the way. Organ accompaniments are tasteful, supportive, and well registered. The beautiful simplicity inherent in these performances of beloved seasonal music will warm many hearts. 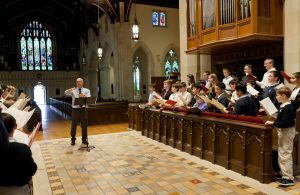 Fine performances of Messiaen’s Les Corps Glorieux and Franck’s Choral in E are played on the four-manual Wicks organ of St Paul’s Episcopal Church in Akron, Ohio. Jamie Hitel is a native of England and former Director of Music of Waltham Abbey, having previously worked in Norway for three years. This recording is from his current church in Ohio, which has a large four-manual Wicks organ (opus 6320 no less!). The program comprises Messiaen’s great cycle of 1939, Les Corps Glorieux and Franck’s famous Choral No 1 in E. The organ has a wide range of color and sounds pretty convincing in both works, especially the Messiaen. The Messiaen is well played with strong character and the organ copes with the many unusual registrations demanded. The struggle between life and death is well conveyed in the fourth movement and there is a real sense of joy in the sixth. The whole piece feels like a ‘performance.’ The Franck is fluent if brisk and there is some unusual ‘soloing out’ in the final line. The booklet contains very full program notes, biography and a specification. The British organist Jamie Hitel was appointed to St Paul’s, Akron, in 2000. The large organ is by Wicks, with colors appropriate for Messiaen. Hitel dispatches the cycle with consummate neatness and accuracy. The Franck Choral builds up well, ending in a blaze of excitement with the addition of the ‘tuba héroique’. An intriguing disc. The coupling of Messiaen and the Belgian composer César Franck is an inspired one. Messiaen’s “Les Corps Glorieux” – The Glorified Bodies – is a heady, almost intoxicating statement of Roman Catholic mysticism. Written when the composer was in his twenties, the piece is subtitled Seven Brief Visions of the Life of the Resurrected. Jamie Hitel is fully committed and inside the musical sound-world. Musically, the Franck complements it beautifully. The first three movements centre around spiritual peace. The first movement – “Subtilité des Corps Glorieux” – The Subtleness of the Glorified Bodies – as translated in the booklet, is pure monody. Freed from earthly concerns, the liberated bodies can float freely, as indeed the melody twists and turns. Immediately identifiable as Messiaen, the music¹s own hypnotic journey gives out the musical language horizontally: the ear is therefore fully attuned for the vertical sonorities of “Les Eaux de la Grâce” – The Waters of Grace. This refers to the river of grace running through the Heavenly City, and this gentle polymodal vision is held at a restrained dynamic level, at once reverential yet holding within it the capacity to unleash spiritual ecstasy. The same shadowy aura shines around “L¹Ange aux Parfums” – The Angel of the Incense. This is music replete with half-voices, silvery and other-worldly. The first three movements act in contrast to the “Combat de la Mort et de la Vie” – The Struggle between Death and Life, the longest section of Les Corps Glorieux. The writing is intensely pictorial in the first part of this movement, a Messiaen battle scene, a struggle against the inevitability of Death. Hitel delivers the fast-moving chords with consummate virtuosity. Visceral and physically involving (it is like being pummeled for four minutes by blocks of sound), the contrasting and longer section radiates serenity. This is extended peace, the harmonies almost unbearably tender. The next two movements concentrate on various attributes of the glorified bodies. “Force et Agilité des Corps Glorieux” – The Power and Agility of the Glorified Bodies – begins like a call-to-arms. These beautiful angels are possessed of a strong backbone of grace. Again monody is used, here with a supple rhythm that conveys the joy of movement. The power of Messiaen¹s sensitivity to intervallic color is shown at its best in the sixth movement, “Joie et Clarté des Corps Glorieux” – The Joy and Radiance of the Glorified Bodies. There is a definable contained ecstasy in the harmonies which makes this compelling. The Mystery of the Holy Trinity – “Le Mystère de la Sainte Trinité” – is a concept that was close to the composer’s heart. Number symbolism (three, of course) is paramount here in this final section. The music itself is delicate, almost preternaturally fragile (as the booklet notes say, “It seems to call us from beyond”). The meditational aspect of this movement almost seems to take the experience to a different plane. Hitel’s focused concentration is all one could ask for. The recording on the new Lammas disc is fine and clear and the organ is obviously an instrument of some majesty. I was not aware Akron, Ohio, was famous for anything other than founding Alcoholics Anonymous. They obviously own a fine piece of organery, too. The title for this CD comes from Elgar’s anthem of the same title and also Douglas Guest’s beautiful, evocative anthem for remembrance, which is executed most sublimely on this disc. What a pity we do not hear it sung in many of our cathedrals. As an Essex-man who was brought up not far from Waltham Abbey, I am delighted to see this mixed choir produce such a fine CD. The choir perform very well indeed Alastair Stout’s Darkening Skies which was commissioned for the choir and explores the journey from the dark battlefield into the light of God, transforming deathly grey to living red. This is a worthwhile buy containing some fine singing. An enjoyable selection of pieces is sung to a high standard. Worthy of special mention is Jamie Hitel’s riveting rendition of Leighton’s major organ work, Et Resurrexit.